Gone are the days when people used to wait for the winter season to plan their ski holidays. 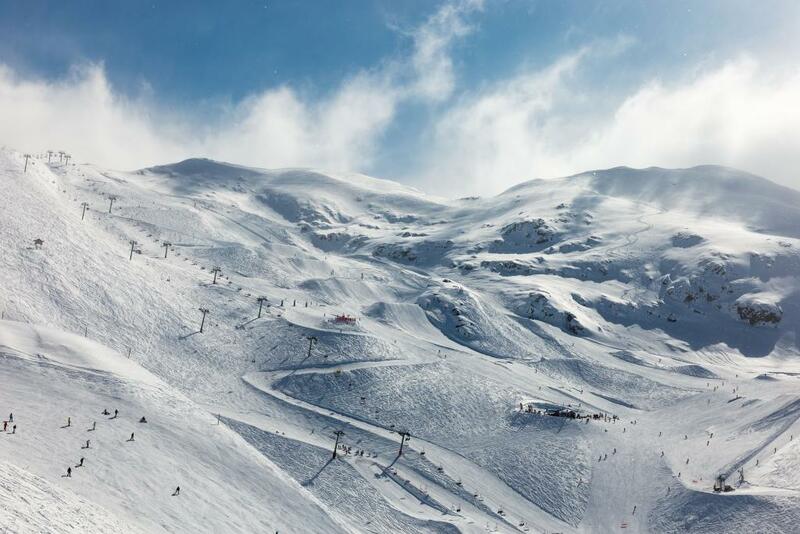 Thanks to the Alp’s towering and glaciated peaks, more than 50 ski resorts in europe are now offering all-year-round glacier skiing in Europe. Not surprisingly, the Glaciers prevents the snow from melting completely. The glaciers cold temperatures below the creates a "snow-foundation" which lasts throughout the year. Glacier skiing in Europe doesn’t always mean skiing on ice; some ski resorts even offer limited powder stashed trails for skiing even in the summer. As a result, Olympic athletes and contenders train and prepare for the games in glacier ski resorts during the summer. Most of the slopes on glaciers are ideal for intermediate and advanced skiers. Glacier skiing in Europe is not limited to skiing in summer, it is also meant for those who like to challenge themselves in winter. Europe is home to some of the finest ski and snowboarding resorts on glaciers. The glaciers of Gefrorene-Wand-Kees (Tuxer Ferner) located in Austria’s Zillertal Alps is famously known to tourists as Hintertux Glaciers. 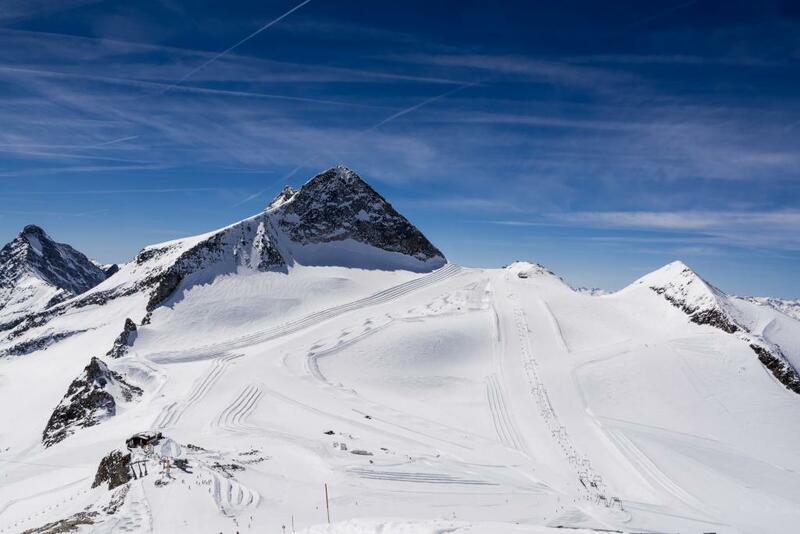 Hintertux Glacier Ski Resort, with a peak of 3,250 m, offers excellent deep snow and a 60 km of skiing terrain, mostly suitable for intermediate skiers. There are 18 chair lifts and cable cars in total and 2 Sunkid Moving Carpets that transport visitors and tourists up to the glaciers. Being one of the ski resorts offering summer glacier skiing in Europe and one of the only two resorts open whole year round in the world, it tends to attract a wide majority of both local and international tourists. The best thing about the resort, in addition to its mountaineering and hiking program, is it is home to a snowboarding park boasting Europe’s highest twin-cable gondola and World Cup half-pipe. As far as glacier skiing in Europe is concerned, Kitzteinhorn ski resort in Central-Eastern Austrian Alps region never disappoints its ski visitors and winter sports loving tourists. The highest ski mountain in Salzburg offering a snow-sure and expansive terrain, Kitzsteinhorn is also Austria’s very first glacial ski area. 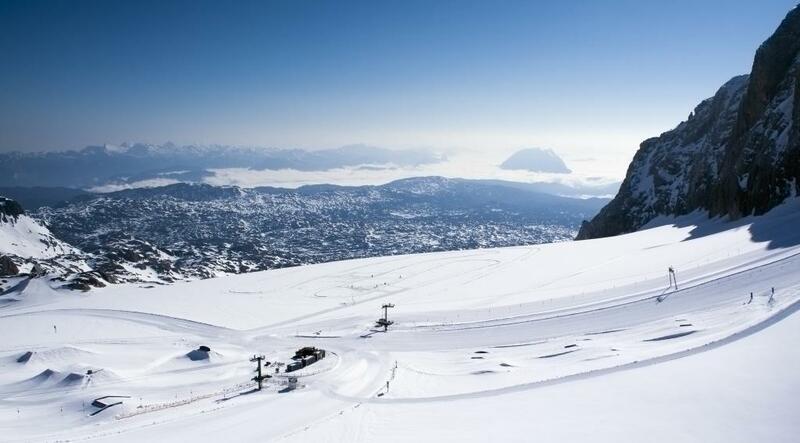 Kitzsteinhorn Glacier has a total of 41 km of skiing and snowboarding slopes serviced by 17 modern lifts. The marked trails are predominantly for intermediates with several wide trails for beginners. There are five routes for snowboarders and some off-piste terrain, bowls and half-pipes for experts. The ski resort is also home to some of the most epic après-ski and restaurants including the relaxing and luxurious pools and saunas of Tauern spa complex. Gilpfewalt, a panoramic viewing platform constructed on the southern side of the resort’s peak, provides breathtaking views of the snow-capped peaks of the High Tauern Mountains. Tignes ski resort located in the Tarentaise Valley in South-Eastern France, offers one of the largest terrain for glacier skiing in Europe. The resort came into the limelight when it held a freestyle skiing competition back in the 1992 winter Olympics, followed by becoming a venue for the winter Paralympics later that year. The resort’s 3,680 hectares of terrain is composed of 480 hectares of marked trails and 3,000 hectares of off-piste areas mostly located on the Bellaverde side of the mountain. 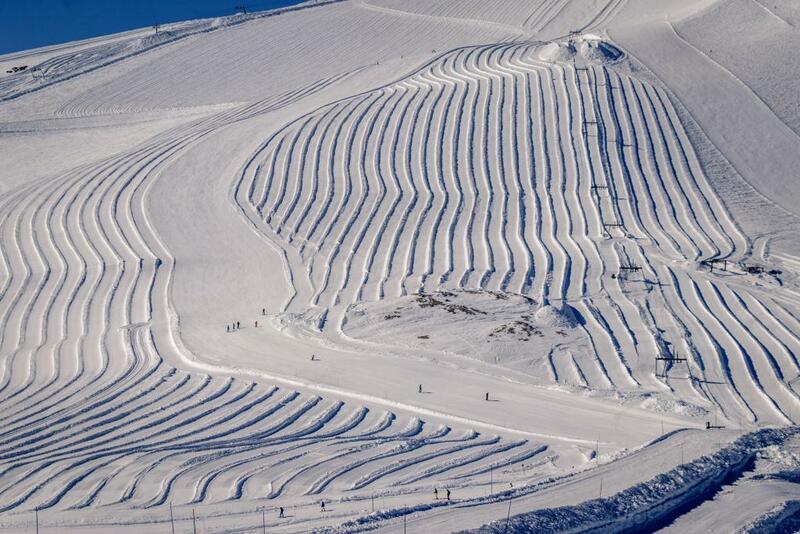 Tignes has 78 lifts in total and 300 km of groomed pistes comprised of 20 green, 67 blue, 41 red and 26 black runs. SaaS-Fee probably offers the most panoramic glacier skiing in Europe with 150 km of groomed runs and off-piste routes surrounded by soaring peaks, all 4,000 m and above in altitude. Straddling the highest mountains in the Swiss Alps, SaaS-Fe’s slopes are located at 3,500 m above sea level with guaranteed snow all year round. 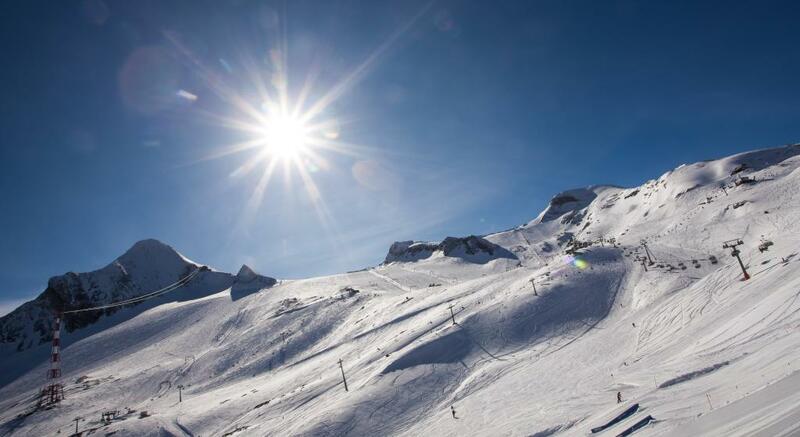 SaaS-Fe covers nearly 100 km of skiing slopes with a total of 22 lifts and a vertical drop of 1800 m. Recognized as one of Switzerland’s best family ski holiday destination, it offers numerous activities for all skill level and for the family. It has numerous nursery slopes for kids and beginners, a freestyle park operating since 1996, winter activities like paragliding and ice skating, and panoramic mountain restaurants including the famous Metro Alpin Restaurant (world’s highest revolving restaurant). 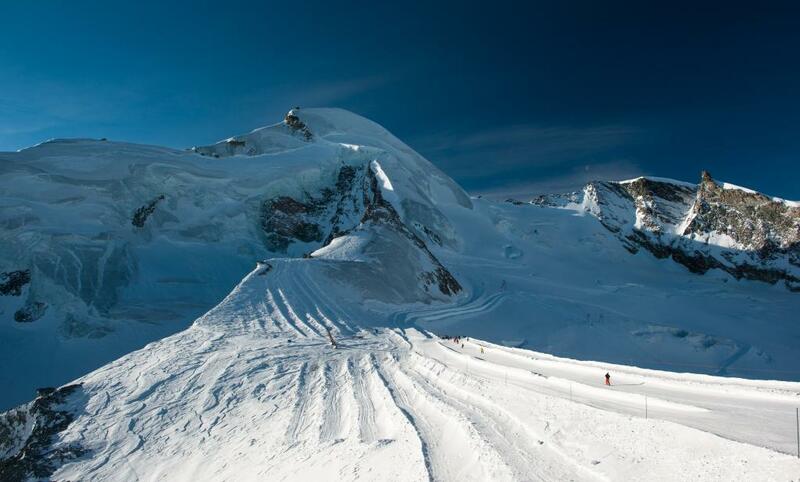 Zermatt ski resort at 3,888m is Switzerland’s highest car-free skiing terrain. Nestled on the slopes of Monte Rosa (4,634m) and at the foot of the iconic Monte Cervino (4,478m), the main and only transportation in Zermatt are ski buses, horse-drawn sleighs and electro-taxis. 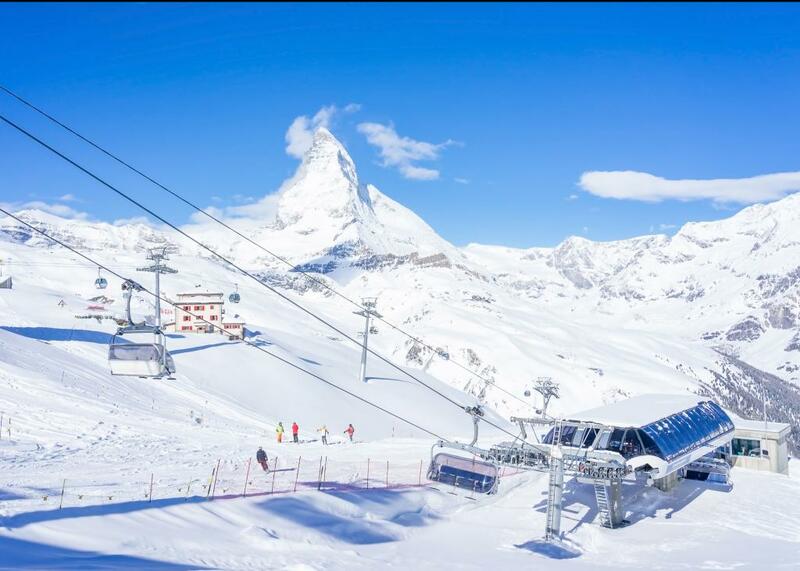 Zermatt is endowed with generous amount of snow all year round and has 34 up-to-date ski lifts. 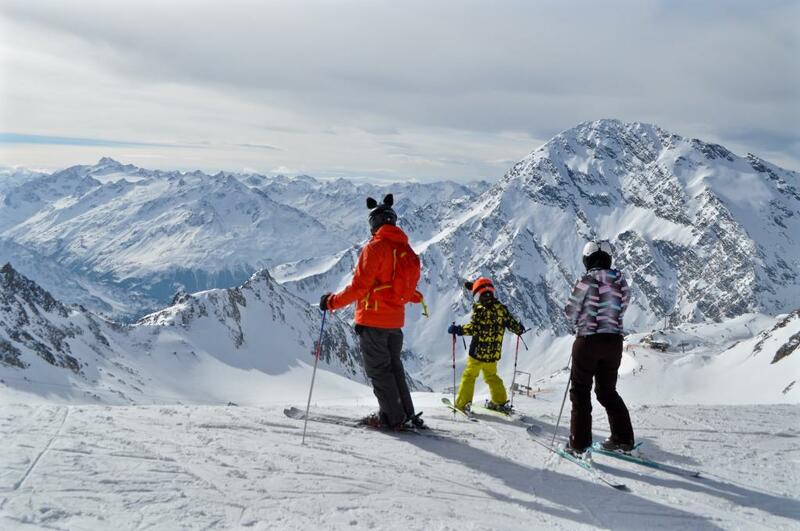 With over 210 km of marked pistes and over 1000 hectares of off-piste terrain, Zermat is one of the largest ski resorts that offers glacier skiing in Europe. A famous tourist destination not only for ski enthusiasts, Zermatt provides a huge selection of winter and summer activities including winter hiking, sledding, snowshoeing and ice climbing. The ski paradise has over 50 bars and restaurants that are sprawled over Zermatt’s village offering outstanding and luxurious after-ski activities and nightlife. Dachstein-Gletscher is the very first ski resort in the eastern Alps that offers a breathtaking glacier skiing in Europe. Located high above the clouds at the heart of Austria, the resort also boasts of numerous tourist activities like its panoramic gondola rides or glacier sightseeing and modern infrastructures offering spectacular views of the mountainous region. At 2700 meter elevation, the 4-mountain ski resort provides 5 km of slopes for advanced skiers and over 150 km trails for cross country trails. There are several ski areas and parks for kids including some night toboggan trails, serviced by 12 ski lifts that are also family friendly. Les Deux Alpes or Les 2 Alpes is a French ski resort high up on the slopes of Ecrins Mountain offering the best glacier skiing in Europe. It has a vertical drop of 2300 meter from the resort’s peak (3600m) to its base area at Mont de Lans (1,300m) and an outstanding lift network comprising 43 mountain lifts. It has a total of 200 km slopes and 95 marked pistes composed mainly of beginner trails and one of Europe’s steepest and longest trail starting from the top of the glacier to its base. 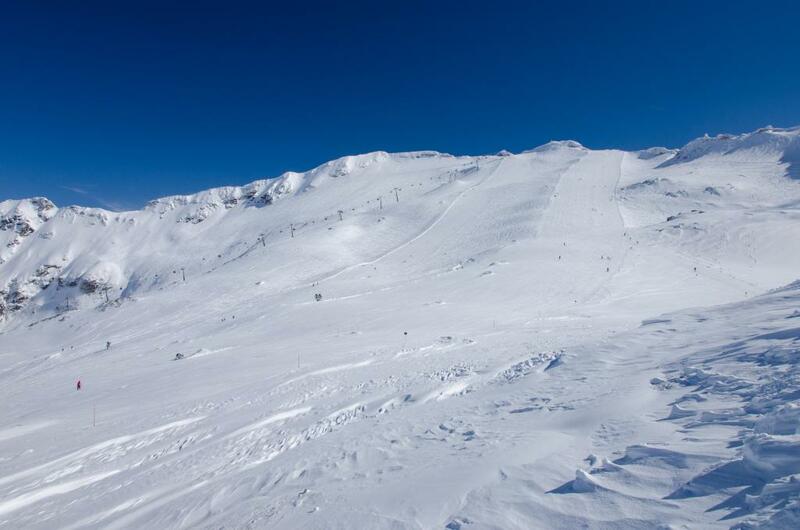 Les Deux Alpes also offers 1000 hectares of off-piste area, a superior Terrain Park and a remarkable night skiing slope at the center of the resort. Cervinia is an alpine ski resort located in the Valle d’Aosta region of north-western Italy. Breuil-Cervinia is best known for its breathtaking glacial horn, Matterhorn (Monte Cervino), providing the resort’s exceptional snow condition and some of the highest slopes for glacier skiing in Europe. 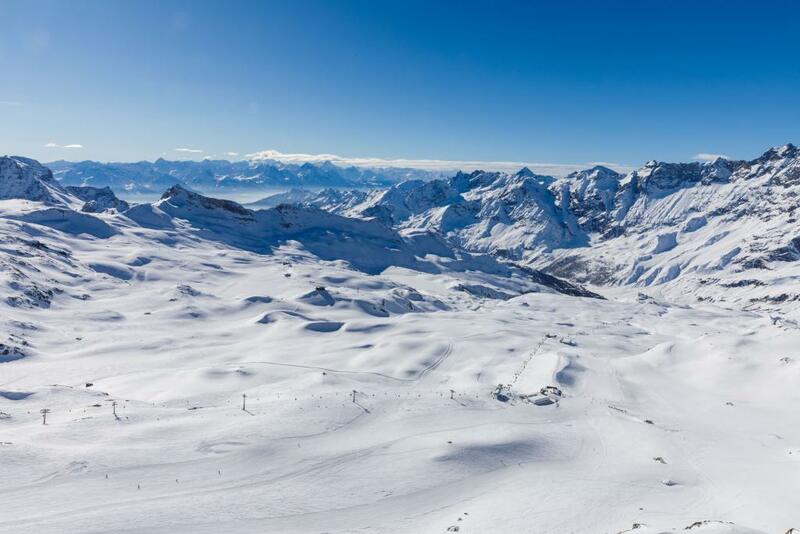 Cervinia ski resort has a lift system made up of 19 ski lifts and 72 ski runs including some cross country trails and three children ski areas. The highest snowpark in Europe can also be found at the resort. Located in Ötztal Valley in the Austrian state of Tyrol, Solden is the biggest glacier skiing area in Austria. It has 150 km of slopes situated between the elevations of 1,350 and 3,350 meters. Sölden is a famous spot for glacier skiing in Europe because of its “Big3” mountains with peaks reaching altitudes over 3,000m. There are 31 lifts in total that can take skiers to the resorts’ three peaks of Tiefenbackogl (3,250 m), Gaislachkogl (3, 052 m), Schwarze Schneide (3,340 m). Attracting not only the world’s best skiers during the FIS Ski World Cup, the resort is also known for its annual festivities and wildest après skis. Moelltal Gletscher is the highest and only ski mountain in Carinthia, Austria. With slopes located between the elevations of 2,108 and 3,122 m and an outstanding snow record averaging 20 meters annually, it is one of the best resorts for glacier skiing in Europe. Moelltal Glacier ski resort offers 17 km of slopes with stunning views at its peak spanning the Dolomites and Hohe Tauern mountain range. Because of its perfect ski condition, it is the official training resort of Austrian and German alpine ski competitors. The slopes of Moelltal can be reached by its 9 ski lifts. From the Flatach valley, Mölltal Express, one of the world’s longest underground funicular can also take skiers and snowboarders to the lower slopes (2,200 m) of the glacier.